Multiple surveys: cosmetic or inclusive? Chapter 7: Web-based or paper-based surveys: a quandary? In recent years, student feedback has appeared at the forefront of higher education quality. In particular, the issues of effectiveness and the use of student feedback to affect improvement in higher education teaching and learning, and also other areas of student tertiary experience. Despite this, there has been a relative lack of academic literature, especially in book format, focusing on the experiences of academics, higher education leaders and managers with expertise in this area. This comprehensive book addresses this gap. 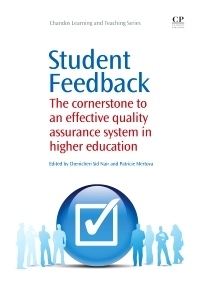 With contributions by experts in the area of higher education quality (academics, higher education leaders and managers) from a range of countries the book is concerned with the practices and theory of evaluation in higher education quality, in particular the issue of student feedback. Dr Patricie Mertova is currently a Research Fellow in the Department of Education, University of Oxford, England. She was previously a Research Officer at the University of Queensland, and, prior to that, a Research Fellow in the Centre for the Advancement of Learning and Teaching (CALT) and the Centre for Higher Education Quality (CHEQ), Monash University, Australia. She has recently completed her PhD focusing on the academic voice in higher education quality. She has research expertise in the areas of higher education and higher education quality. Her background is also in the areas of linguistics, translation, cross-cultural communication and foreign languages.